Yes despite it’s ridiculous name it is sweeping the country and the fastest growing sport in the world. I play and as a result people frequently ask me about my experience of playing. This prompted me to use the opportunity in this month’s newsletter to expose those of you who are curious about the game and want to know more. Pickle ball is the fastest growing sport in the world for many reasons but the biggest is it is just flat out fun. Many of you may have heard of this new craze but have no idea what it is and many of you are already avid devotees. For those of you who are curious this will remove some of the mystery. 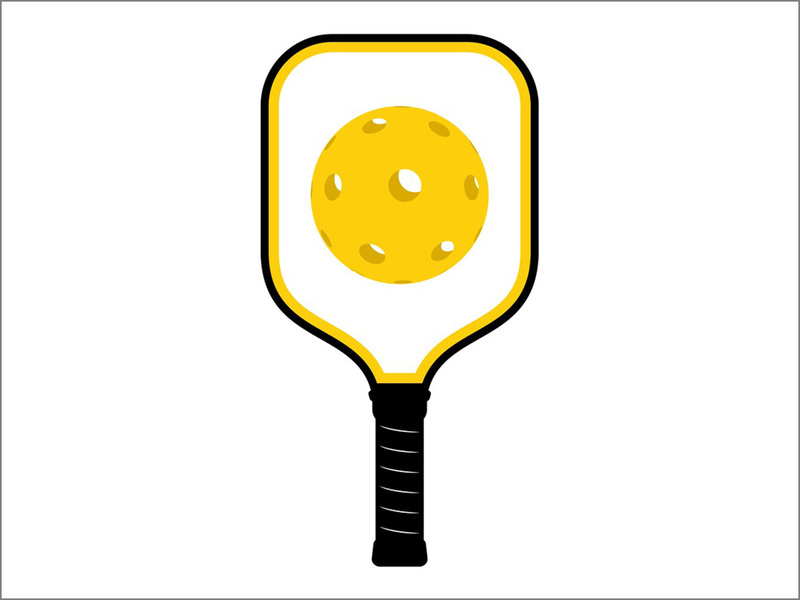 Pickleball is a combination of three sports-tennis, badminton and ping-pong. It is played indoors or outside on a court similar to a tennis court that is about two feet shorter on the ends but the same width. The paddle is flat and approximately the same size as a racquetball racquet. The ball is the size of a whiffle ball on steroids or about the size of a baseball. Tennis serving boxes are in the front while the pickball serving boxes are in the back close to the server. It can be played with two, three or four players. It won’t break the bank. Most places available for play are either free or have a nominal fee of $3-$5. Paddles can be purchased from $28 to $198 at pickleballcentral.com and amazon (of course). Some facilities have extra paddles available for your use. You don’t have to coordinate everyone’s busy schedules. You simply show up any time during the predetermined time and play for as little or as long as you want. Most everyone can play. If you have a previous history of playing any of the sports involved you will pick it up in just a few minutes. For those of you with little to no racquet experience you can also learn very quickly however may take a little more practice to become proficient. You can play virtually anywhere. Whenever I travel I usually do an Internet search for local pickleball locations and simply show up at the appointed time. People are always welcoming to outsiders. For example if I travel to St. Simons Island I will do an Internet search for pickleball St. Simons and it let’s me know the details of where and when games will be played. It’s a very social game. Everybody is generally welcoming and gracious. Over time you get to know an entire new group of friends and competition can range from very competitive to social but either way you will get a good workout and get your body moving. The limited size of the court is also a big advantage for those with knee or foot issues. Games generally don’t last a long time. You play to 11 however if there are a number of people waiting games are often shortened to 7 to allow more playing time for everyone. It’s great exercise and you can get a good workout but you generally are just having fun so you don’t notice the effort it takes. No matter what part of the country you live in consider checking out your local pickle ball centers and give it a try. I think you’ll have fun and be glad you did. Does Your Body Need A Vacation?